The Ministry of Information is considering whether to suspend two opposition newspapers for allegedly failing to back up ac­counts that four monks and nine demonstrators were being held in Kompong Speu province. 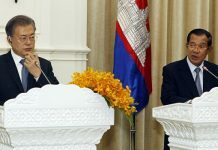 Secretary of State for Infor­mation Khieu Kanharith said Tuesday he might suspend Udom Katte Khmer (Khmer Ideal) and Samleng Yuvachun Khmer (Voice of Khmer Youth). 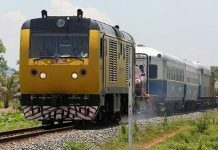 He said he had given the Khmer-language papers 72 hours to “provide more details about the allegations of four monks being detained in Stung Chral,” a small river community near Pech Nil pass in Kompong Speu province. 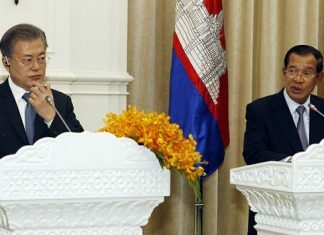 He also said the papers alleged that nine demonstrators were being held by police after taking part in opposition protests last month in Phnom Penh. Pech Nil is a notorious dumping ground for murder victims. The two Khmer-language pa­pers, Khieu Kanharith said, failed to produce evidence substantiating their reports, leading him to conclude they were fabricated. “We’re now considering shutting down these papers until they get details to show us about this information,” Khieu Kanharith said. An order was being prepared to submit to the courts, he said. The government issued a statement on Sept 13 saying that no monks were being detained. But the opposition papers stood by their accounts Tues­day, claiming their reporting was based on interviews with family members of the victims and confidential human rights reports. “We are not afraid to publish and con­tinue to publish be­cause we have enough evidence,” said Keo Sothea, publisher of Sam­leng Yuvachum Khmer. He said he had received a phone call from the Ministry of Information asking him not to publish today, but said he would continue to publish until he receives an official letter from the ministry. Thousands of people, including many monks, took to the streets of the capital last month to pro­test the results of the July 26 election and the government’s failure to investigate thoroughly claims of election irregularities.